How to prepare safely New Years Eve! 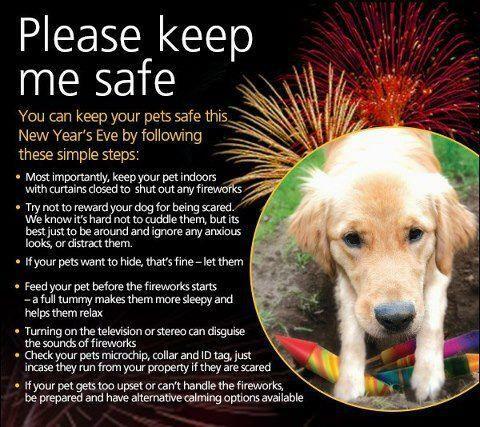 New Year’s season is one of the most fun and joyous holidays of the year. However, did you know that it is also one of the most dangerous holidays of the year? It is estimated that during Christmas and New Year’s season, almost 95 million Americans will be on the road traveling to visit family and friends. 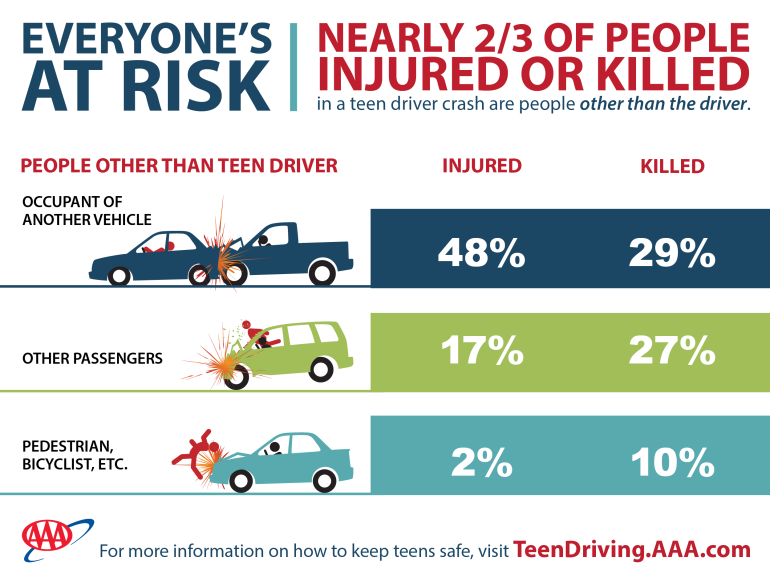 People are much more likely to drink and drive around Jan. 1 than during any other major holiday of the year. 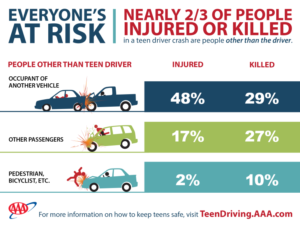 Almost half of all car accidents on New Year’s Eve and New Year’s Day are due to drinking and driving. How the cold weather can hurt our health. There are workers and people at home working around the house outside who are exposed to extreme cold or work in cold environments for a long period of time may be at risk of cold stress. Extreme cold weather is a dangerous situation that can bring on health emergencies in susceptible people, such as those without shelter, outdoor workers, and those who work in an area that is poorly insulated or without heat. What constitutes cold stress and its effects can vary across different areas of the country. In regions relatively unaccustomed to winter weather, near freezing temperatures are considered factors for “cold stress.” Whenever temperatures drop decidedly below normal and as wind speed increases, heat can more rapidly leave your body. These weather-related conditions may lead to serious health problems. When exposed to cold temperatures, your body begins to lose heat faster than it can be produced. 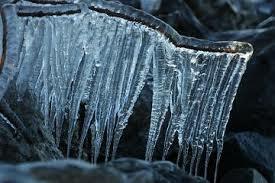 Prolonged exposure to cold will eventually use up your body’s stored energy. 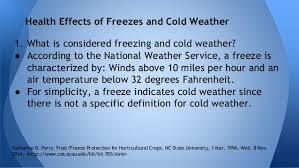 The result is hypothermia, or abnormally low body temperature. A body temperature that is too low affects the brain, making the victim unable to think clearly or move well. This makes hypothermia particularly dangerous because a person may not know it is happening and will not be able to do anything about it. The symptoms you see with this hypothermia (body exposed to freezing temperatures) are: SHIVERING, LOSS OF COORDINATION, FATIGUE, CONFUSION OR DISORIENTATION. When the hypothermia gets severe the symptoms go to NO SHIVERING, BLUE SKIN (CYANOTIC), DILATED PUPILS, SLOWED PULSE AND BREATHING, AND LOSS OF CONCIOUSNESS. Another problem secondary to cold weather is cold water immersion creates a specific condition known as immersion hypothermia. It develops much more quickly than standard hypothermia because water conducts heat away from the body 25 times faster than air. Typically people in temperate climates don’t consider themselves at risk from hypothermia in the water, but hypothermia can occur in any water temperature below 70°F. Survival times can be lengthened by wearing proper clothing (wool and synthetics and not cotton), using a personal flotation device (PFD, life vest, immersion suit, dry suit), and having a means of both signaling rescuers (strobe lights, personal locator beacon, whistles, flares, waterproof radio) and having a means of being retrieved from the water. Below you will find links with information about cold water survival and cold water rescue. Another problem due to cold weather is frostbite is an injury to the body that is caused by freezing. Frostbite causes a loss of feeling and color in the affected areas. It most often affects the nose, ears, cheeks, chin, fingers, or toes. Frostbite can permanently damage body tissues, and severe cases can lead to amputation. In extremely cold temperatures, the risk of frostbite is increased in workers with reduced blood circulation and among workers who are not dressed properly. Signs or symptoms of frostbite are reduced blood flow to hands and feet (fingers or toes can freeze), Reduced blood flow to hands and feet (fingers or toes can freeze, numbness, tingling or stinging, aching, pale to blue and even waxy skin. Another problem from long exposure to cold that can arise is trench foot, also known as immersion foot, is an injury of the feet resulting from prolonged exposure to wet and cold conditions. Trench foot can occur at temperatures as high as 60 degrees F if the feet are constantly wet. Injury occurs because wet feet lose heat 25-times faster than dry feet. Therefore, to prevent heat loss, the body constricts blood vessels to shut down circulation in the feet. Skin tissue begins to die because of lack of oxygen and nutrients and due to the buildup of toxic products. Symptoms of trench foot include: Reddening of the skin, Numbness, Leg cramps, Swelling, Tingling pain, Blisters or ulcers, Bleeding under the skin, and Gangrene (the foot may turn dark purple, blue, or gray). Wear appropriate clothing. Tight clothing reduces blood circulation. Warm blood needs to be circulated to the extremities. Make sure to protect the ears, face, hands and feet in extremely cold weather. Wear a hat; it will keep your whole body warmer. (Hats reduce the amount of body heat that escapes from the head). Monitor your physical condition whenever you go outside in the cold and prepare properly for that weather. 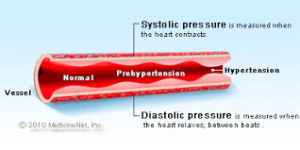 High Blood Pressure or Hypertension affects 80 million Americans and nearly half of the people in the UK between the ages of 65 and 74, and a large percentage of those between the ages of 35 and 65. One of the problems associated with high blood pressure is that you will probably not even know you have it until you happen to have your blood pressure taken during a routine physical examination. Upon diagnosis, you may wonder why you never saw it coming. Most people don’t. Only those with severe high blood pressure experience any warning signs at all. These signs can include headaches, impaired vision, and black-outs. It is the measurement of the force that blood applies to the walls of the arteries as it flows through them carrying oxygen and nutrients to the body’s vital organs and systems. Naturally, our blood is under pressure as it rushes through our arteries. Even those with blood pressure in the normal range will experience an increase in their blood pressure during rigorous physical activity or during times of stress. It only becomes a problem when the blood continues to run high. This condition of blood pressure is known as hypertension or high blood pressure and in 95% of the cases, the cause of it is never known. 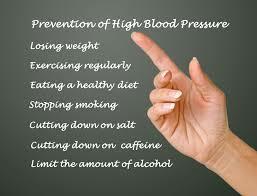 However, we do know the factors that set a person up to develop hypertension. AGE-THE OLDER, THE HIGHER PROBABILITY YOU WILL END UP WITH B/P DEPENDING ON YOUR HEALTH AND HOW GOOD YOU TAKE CARE OF YOURSELF. RACE-HIGHIER IN AFROAMERICAN AS OPPOSED TO WHITE. 1-Obesity=Those with a body mass index of 30 or greater. 2-Drinking more than 2 to 4 alcoholic drinks a day. Sometimes the cause of a person’s high blood pressure is determined, but this happens in only 5% of the cases. When a cause is found, the person is diagnosed with secondary high blood pressure [hypertension]. In most of these cases, the cause can be linked to an underlying illness such as kidney disease, adrenal gland disease, or narrowing of the aorta. Contraceptive pills, steroids, and some medications can also cause secondary high blood pressure [hypertension], though instances of this are not all that common. We hear the numbers, but do we really know what they mean? Since your blood pressure numbers can help you to understand your overall health status, it is important that you keep track of it. By knowing where your numbers are right now, you can head off such serious high blood pressure complications as angina, heart attacks, stroke, kidney damage, and many others that might surprise you – like eye problems and gangrene. The top number– this is your systolic blood pressure. It measures the force of blood in the arteries as your heart beats. The top number means the pressure is reading your heart at work. That is why this number is always highier. The bottom number – this is your diastolic blood pressure. It is the pressure of your blood when the heart is relaxed in between the times when it is pumping. Means the pressure is reading your heart at rest. That is why the number is always lowest. Your blood pressure requires monitoring when you have a systolic blood pressure of 140 or over and/or a diastolic blood pressure of 90 or over. Those with diabetes must maintain a lower blood pressure that those who don’t have the condition. Diabetics should maintain a blood pressure of less than 130/80. It is wise to monitor your blood pressure at home in addition to having it taken at your doctor’s office. This will allow you to provide your doctor with readings that have been taken over time, providing a more in depth look at your personal health condition. This will help him or her to prescribe the right hypertensive medication and treatment for your specific condition. The best blood pressure monitors are those that take your measurement from the upper arm. Those that provide readings from the wrist or finger are not as reliable. You’ll also want to make sure that the blood pressure monitor you are considering has been proven in clinical trials. Trusted name brands include those made by Omron, LifeSource, Mark of Fitness, Micro Life, and A and D Instruments. There are other brands available – the important thing is to do your research. Hearing loss affects people in different ways. Left undiagnosed or untreated, it can damage communications and erode relationships. 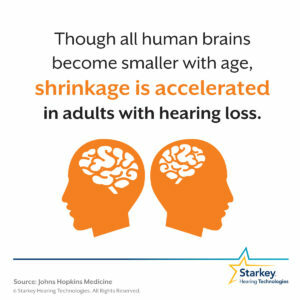 Over time, hearing loss may degenerate from a strictly physical condition to a psychological one, which is just one of the reasons it is so important to seek a solution promptly. For most people with hearing loss, there is help. 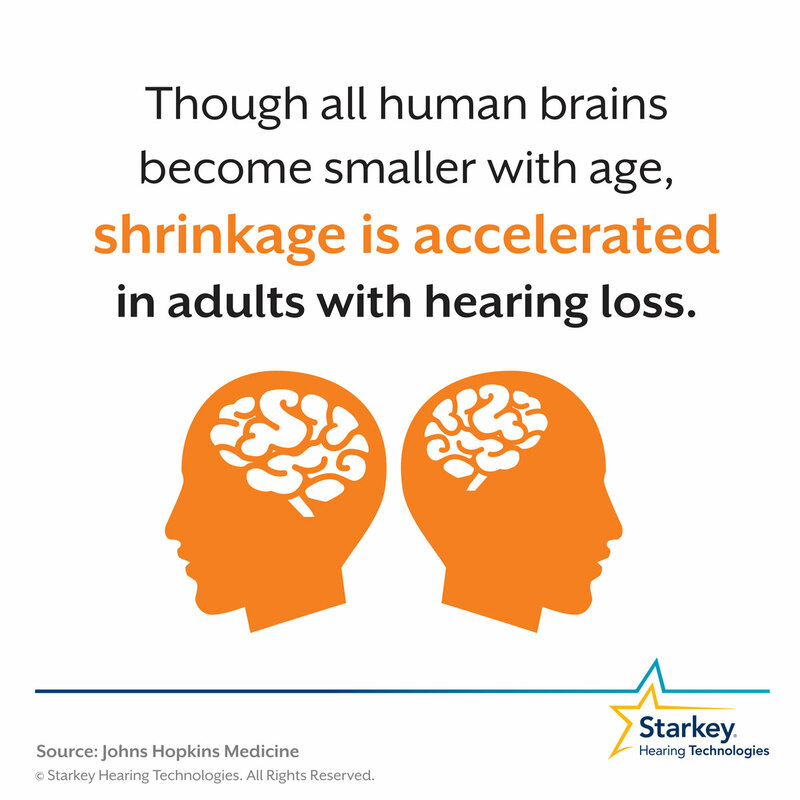 Properly fitted hearing aids improve communication for at least 90 percent of people with hearing loss. Screenings for diabetes and other conditions typically do not include hearing tests. If you have one of these conditions, it’s probably a good idea to ask for a referral to a hearing care professional who can conduct a hearing screening to see if you are suffering from any kind of hearing loss. Many other factors can lead to hearing loss, including your family history, repeated exposure to loud noises, injuries, and smoking. If you have hearing loss, you are not alone. 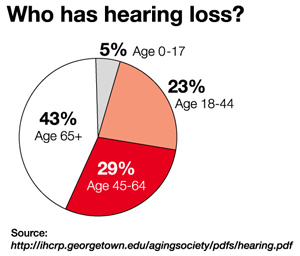 About one in six people experience some degree of hearing impairment over the course of their lives. 3-National Institute on Deafness and Other Communication Disorders (NIDCD). Of adults ages 65 and older in the United States, 12.3 percent of men and nearly 14 percent of women are affected by tinnitus. Tinnitus is identified more frequently in white individuals and the prevalence of tinnitus in almost twice as frequent in the South as in the Northeast. About 2 to 3 out of every 1,000 children in the United States are born deaf or hard-of-hearing. Nine out of every 10 children who are born deaf are born to parents who can hear. Roughly 25 million Americans have experienced tinnitus. Approximately 615,000 individuals have been diagnosed with Ménière’s disease in the United States. Another 45,500 are newly diagnosed each year. Approximately 3 to 6 percent of all deaf children and perhaps another 3 to 6 percent of hard-of-hearing children have Usher syndrome. In developed countries such as the United States, about 4 babies in every 100,000 births have Usher syndrome. One out of every 100,000 individuals per year develops an acoustic neurinoma (vestibular schwannoma). More than 500 million people around the world are experiencing some form of hearing loss right now. Are you one of them?